2 years ago today, Granny's physical body left us! Sometimes it is hard to believe it has been 2 years already, but other times it seems like it has been much longer. Time is like that I guess! I still think of her so often and find myself wishing many days I could pick up the phone and call her. I wish I could show her things I have made, I wish she could see my garden and things I have done to the house, but most of all I wish she could see my kids! She would be amazed at how they have grown. She would get a kick out of the fact that Benji would now tower over her and that he could probably throw her over his shoulder and carry her around. She would love for Rachel to be able to come pick her up now that she drives and take her out for some fun. She would laugh at Jesse's magic tricks and love seeing all Caleb's Lego creations. She would think it was amazing to see Hannah's stitched creations as she realizes her crafting gene reached to another generation! 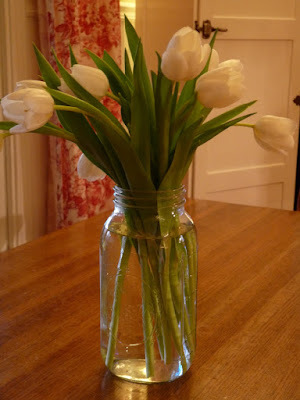 One of our traditions, Granny and me, was for me to buy her tulips as soon as they were available at the grocery. 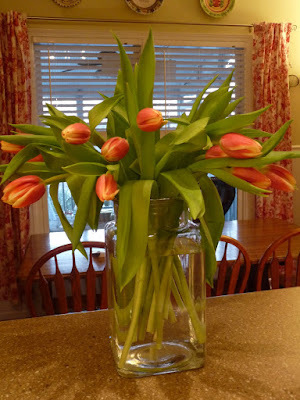 I LOVE tulips and so did she and I always bought her some as a promise that spring had to be just around the corner. I found my throat suddenly constricted the other day as I rounded a corner in the grocery store and saw bunches of tulips gazing back at me. I was drawn to them as I always am and had to brush away a tear or two as I gathered some bunches to take home. Spring is just around the corner in spite of her absence, but I sure do wish she was still here to enjoy the promise with me!! Love you, Granny, and miss you so very much!! Sweet memories and thoughts of your dear Granny, Barb. I know you miss her. Love you, friend. Hugs to you friend! I'm sorry for the loss of your precious Granny. I love the sweet memories you share of her.